We are known as leading manufacturer & supplier of wide gamut of quality Ceramic Vermiculite Coted Rope which helps to increase the abrasion, flame and high temperature. 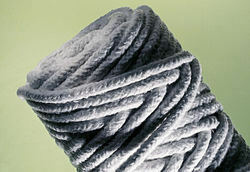 These coated ropes are non-flammable and manufactured with alumina, silica and ceramic fiber. It is free from asbestos and can be avail by our clients at competitive price. 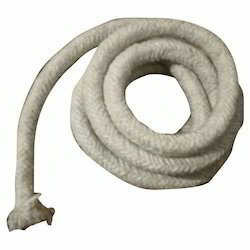 HongYu Ceramic Fiber rope includes twisted rope, round braided rope and square braided rope. High Density Square Type Aluminum Fiber Rope (square packing) is dense, resilient, high performance ceramic fiber material plaited from E-glass, stainless steel wire or high temperature alloy wire inserted ceramic fiber yarn to form a packing in square section. Ceramic Fiber Rope is made of high temperature resistant up to 1260 C, ceramic fiber textiles feature excellent properties of lightweight, low thermal conductivity and chemical stability resisting attack from most corrosive agents. High Temperature Refractory Sealing Ceramic Fiber Rope Ceramic fiber rope(packing) are dense and fabricated from high performance ceramic fiber yarn material braided around a core of ceramic fiber rope to form a packing in round or square braid. Ceramic fiber textile products include cloth, rope, stripe, yarn and other products, which is made from ceramic Fiber Cotton, EG filament, high temperature stainless steel alloy wire through the special process. Packaging Details: 100% Dust Free Packing. As Per Your Requirements. Every Bag wills Be At Best Quality Packing. Per Roll/Bundle will be pack in a Plastic Packaging. Non Asbestos Packing Rope Single flush double double non - asbestos compound sheet is to use the asbestos copy from cardboard and 0.18 ~ 0.25 mm carbon steel tinplate sprint composites.The product has good properties, such as swelling, sealing and long service life.Composite structure: Blunt tooth tin + non-asbestos copy paper + tooth tinplate. Ceramic Fiber Rope Round braided rope is dense, resilient, high performance ceramic fiber material fabricated from ceramic fiber yarn braided around a core of ceramic fiber rope to form a packing in round section. It is widely used for a broad variety of high temperature gasketing, packing and sealing application. Ceramic Fiber Rope Square braided rope (square packing) is dense, resilient, high performance ceramic fiber material plaited from E-glass, stainless steel wire or high temperature alloy wire inserted ceramic fiber yarn to form a packing in square section. 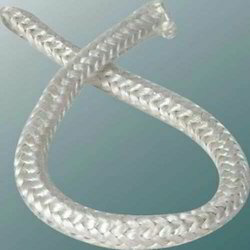 Twisted rope is fabricated from ceramic fiber yarn twisted left hand/right hand together to form a rope of specified diameters ranging from 3 mm to 50 mm, with glass filament, stainless steel wire or high temperature alloy wire inserted to provide high strength at elevated temperature. Refractory Ceramic Fiber Round Insulation Rope, use a special high strength swing long fiber with good spinning performance as raw material, which is made by spinning and weaving. The rope is reinforced with fiberglass filament, and optional Inconel/alloy steel wire. Ceramic Fiber textiles (cloth, tape and rope) contain a certain amount of binder material which is normally burned at lower temperature and does not affect the insulation property. 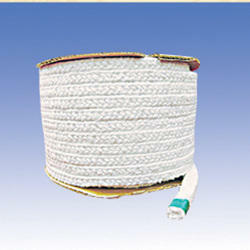 The Ceramic Fiber Braided Round & Square Ropes are manufactured from superior quality Ceramic fiber yarn, braided cover on cover to form a solid packing. It is suitable for caulking and general thermal insulation application, with properties of low thermal conductivity. The yarn is reinforced with ASTM grade E-Glass Filament & can withstand very high temperature. This packing is available in various sizes from 6mm to 100mm or above on request. 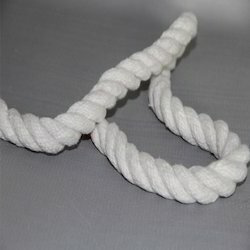 Ceramic fiber rope includes three styles twisted, round braided and square braided. 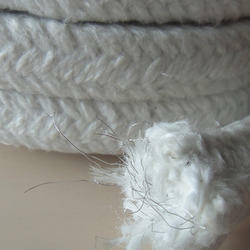 All are made of our high quality ceramic fiber yarns. They can be used for high temperature applications up to 1000. 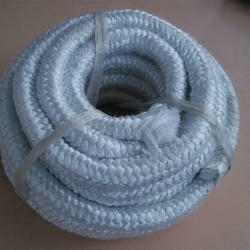 The rope is reinforced with fiberglass filament and optional stainless steel wire. It contains a certain amount of binder mateial which is normally burned at lower temperature and does not affect the insulation property. Ceramic fiber rope is dense, resilient, high performance ceramic fiber material fabricated from ceramic fiber yarn braided around a core of ceramic fiber rope to form a packing in round section. It is widely used for a broad variety of high temperature gasketing, packing and sealing application. Square braided rope (square packing) is dense, resilient, high performance ceramic fiber material plaited from e-glass, stainless steel wire or high temperature alloy wire inserted ceramic fiber yarn to form a packing in square section. 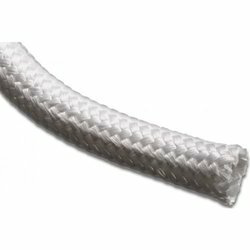 Twisted rope is fabricated from ceramic fiber yarn twisted left hand/right hand together to form a rope of specified diameters ranging from 3 mm to 50 mm, with glass filament, stainless steel wire or high temperature alloy wire inserted to provide high strength at elevated temperature. 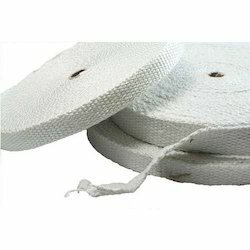 Thermal Insulation Ceramic Fiber Square Braided Rope: textile products include cloth, rope, stripe, yarn and other products, which is made from ceramic fiber cotton, EG filament, high temperature stainless steel alloy wire through the special process. In addition to the above products, we also provide special high temperature textiles of specifications and performances, according to temperature requirements and the specific operation conditions defined by users. 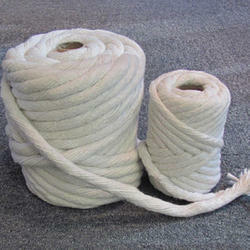 We provide round rope, square rope and twisted rope. 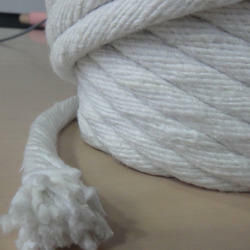 CCEWOOL High Temperature Ceramic Fiber Rope is a length of fibers, twisted or braided together to improve strength for pulling connecting and can also be called as fibril or filament. 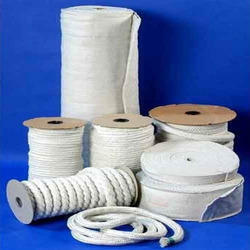 We provide round rope, square rope and twisted rope. Both kind has two type, glass filament reinforced and stainless stainless steel reinforced.